The Bale Company offers a large selection of Medallions, ranging from 1 1/2 inch to 3 inches in diameter. Medallions selected from this section are designed with a small loop at the top that will accommodate a neck ribbon, which can also be purchased in conjunction with any item offered in the Medallion Section. 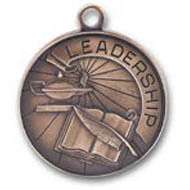 If you select a medallion as an offered item with a Plaque or a Trophy, the medallion is provided without the loop, for proper mounting on the trophy or plaque.